Funniest part is that I rarely do food court dining. I wish I can tell you why or why not in wanting to something of this sort. I feel like in a bad sense of deja vu of having a cafeteria food back in my younger days in school. Remembered all those stale pizzas, sloopy joes, or tater tots that barely passed as edible gourmet chow? Yup, the food they feed to youth those days are worse than rations you give to the military. At least the military can use the excuse of there is no working stove in the front line. Want to know something so funny? Apparently now, some of the new or old exciting eatery can be found in food hall. Food court dining are making a huge splash. 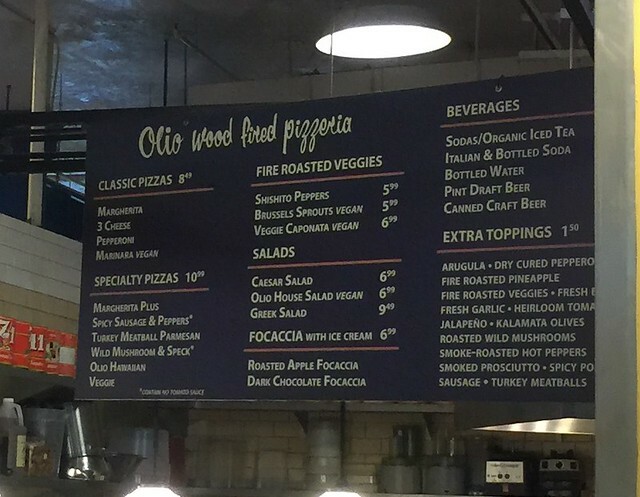 One of my favorite pizza place can be found in a downtown food stall / Farmer's market called Grand Central Market. It is sort of an exciting time for this venue of a wide open space where they now houses some of the quick eateries of different cuisines, desserts, coffee shops, and breweries. In the past, all you get a run me down Chinese food or Mexican food as they were catered to the surrounding employees that worked in the office buildings of downtown. Hustle and Bustle as how they do when they need bites on the run as most can walk in and out of the joint within their hour lunch break. What set this food court apart was having this gorgeous of a square space that houses one of the best personal pizza you'll get. 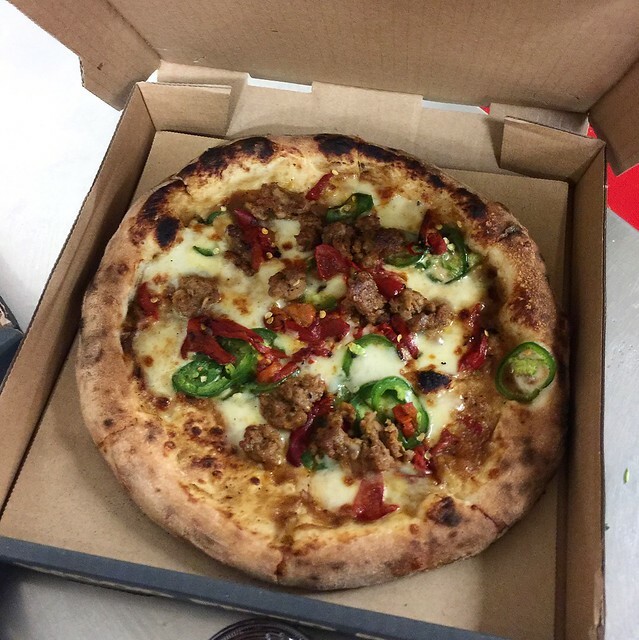 Olio's, a casual and somewhat of a fast, made to order pizza operation. This is the 2nd installment after the popular Santa Barbara eatery. Even though this is not intended to be a food stall, it worked out to be a popular dining destination for many diners of all ages. Personal Pizza can be had in one size with four slices cut immaculately into equal triangle shape size. Because of the fast pace action here, customization are only available on what the menu will be offered. This will not be like your local made to order pizza operations (ie Pizza Rev, Mod Pizza, Blaze Pizza, etc etc). 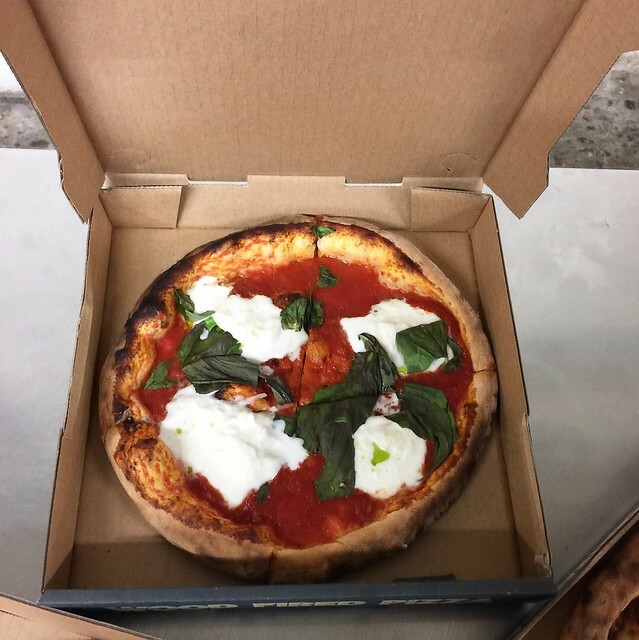 What they do offered are some of the best wood fired pizza you'll get. Especially in a closed indoor proximity such as Grand Central Market. This is the type of food court dining most people crave for these days. It's weird to see a farmer's market that predominately sells farmed produces got changed into a fall hall in matter of years. Baked goods are still sold in some space and a few candies shops are left. I guess if this fast paced, made to order pizzeria can be part of the new trend in dining, then I'm all for it. 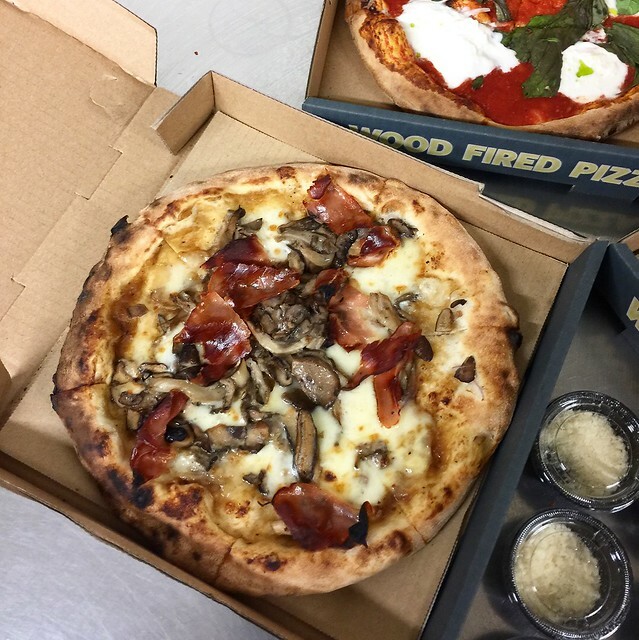 In a way, craving for these terrific pizzas are worth the long search of parking in this surrounding area. That's the only drawback of going to Grand Central Market these days in burgeoning downtown. One more notch on my food stand category!